Unbroken Thumos is the boss in Mission 13 Unbroken in Destiny 2. - He's escorted by 2 Commander Legionnaires which can be taxing. Unbroken Thumos is probably the chunkiest boss in-game, which can be quite taxing. However, what makes him increasingly annoying is the multiple phases he has that either changes his attack pattern or summon another group of enemies. To make matters worse, he has two Commander Legionnaires following him around. However, there are still ways to defeat him. Thumos has two Commander Legionnaires escorting him. However, the way to do this is to focus on the Commander Legionnaires first to prevent yourself from being overwhelmed by their attacks. You can use your Super Attack and a Grenade to tear through the Commander Legionnaires. With that, you can also recharge your Super Bar. First phase: He wields a sword and enters melee combat. As he enters melee combat, leap back and literally unload a full clip into Thumos’ face. This works well especially if you’re an Arcstrider. Players can choose to “cling” to him to be able to see where his next strike will go. This also gives you a better chance for a headshot as you’re within pointblank range. Warlocks will have to hover around him. It’s the biggest advantage the player has as a Warlock which is to Glide around and drop Grenades or use specific moves. However, another strategy is the hit-and-run strategy which is possible due to the Warlock‘s gliding. Titan barriers may have a disadvantage here as it may force you to sit in one place. 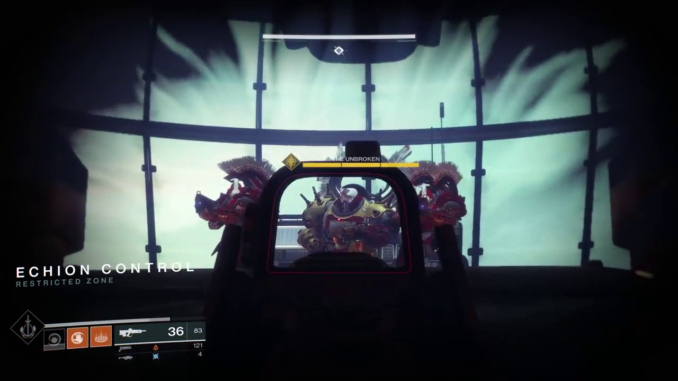 However, if the player can use the barrier as a temporary means to draw aggro, it may work in the Titan‘s favor. Second phase: Once he reaches ~60% of his health, he’ll summon another group of enemies. However, he’ll soon bring out a rifle and begin hovering around you. As he hovers around you, he’ll unleash a hail of bullets. So take cover and unleash as many bullets as you can in Thumos’ face. Third phase: He summons more enemies along with another Gladiator. After taking out the Gladiator, slaughter Thumos with a Super or a Grenade.